Last year I had the complete pleasure of working with Country Gardens Magazine! A simple little garden apron took me on an amazing journey. Better Homes And Gardens Test Garden. I arrived with carefully stitched and pressed aprons, supplies and props (vegetables from my own garden). they took my nerves away in the first 5 minutes. To style for a magazine photo shoot, a dream come true. Not so sure about the modeling part, but what the heck. Check out the story in the Fall issue of Country Gardens. You can even win an apron! Congratulations, Stacey! How exciting is/was this! Audrey, This was the adventure of my lifetime. When I met Kate Carter-Frederick the Field Editor on the photo shoot here at our garden, she was such a joy, as a person and professional. We talked and talked and I’m so grateful to now call her friend. When I gifted her an apron a few weeks after she had been here, she called and asked if I would like to help produce this for a possible story in Country Gardens magazine. Not knowing what I was doing, we started the process, Kate handled the actual real work, I sewed and emailed and sent photos! Now, she is juggling numerous story’s at the same time. I had just this one task! I lost count of how many aprons I sewed. Wrote pattern directions and planned props. It was nearly 9 months from start to shoot date, last September. As I stood outside those gates of Better Homes and Gardens Test Garden on a cool, sunny morning, peering inside. I was shaking, not from the cold, but nerves! I had all my aprons, tools, props gathered at my feet. At 50 years old, I was doing what I had always dreamed of would be my dream job. I had no idea what to expect…how this day was going to unfold…I paced waiting for the arrival of the rest of the “team”. I saw a few acorns on the sidewalk that had dropped from an Oak Tree inside the gated gardens. I reached down and took 3 acorns and tucked them in my jacket pocket. Those acorns still sit on my desk here, and they remind me how little seeds get planted everyday and how days can unfold. How wonderful!!! 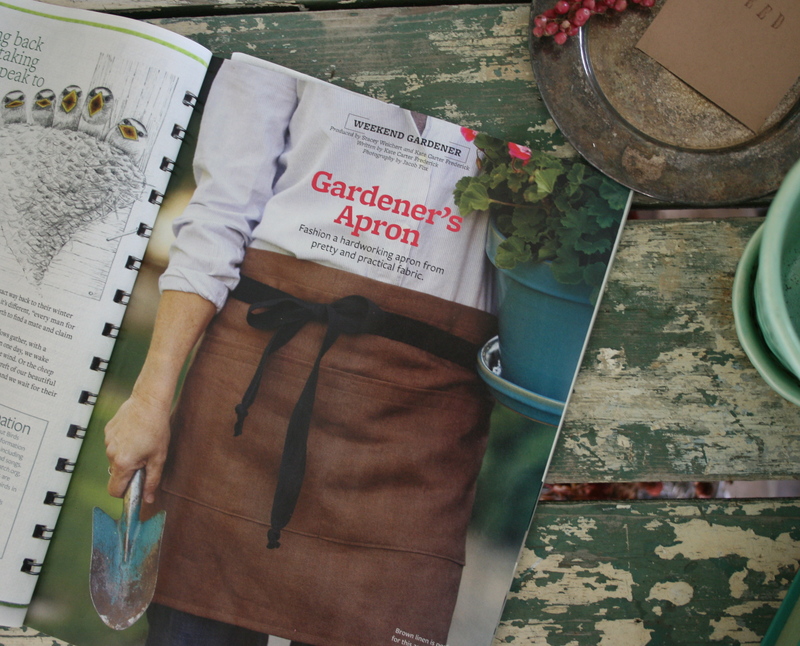 Love the photo and I’d love to win an apron… I’ll be sure to check it out! Let me know what you think! And you can laugh at the silly picture of me on page 2!, my kids did! Oh, what fun that must’ve been! It was an amazing place to spend the day! I even got a tour of Meredith when we were finished shooting in the garden. Oh, my that place…the test kitchens…amazing is the word I just keep using! I am looking forward to getting my issue..will be so fun to read! HyVee had them on the shelf! It’s a good issue with lots of pretty in it!